One of the many dental issues an individual can experience is a cracked tooth. Cracked or chipped tooth can compromise your smile and may even cause tooth sensitivity or pain making it difficult to eat. A simple dental problem like this should not be ignored; it needs immediate attention to prevent severe damage or other dental complications. We at Riverheart Family Dentistry offers Cracked Tooth Repair to provide urgent dental treatments and prevent any other complications from developing. A sudden change of temperature in the mouth from eating and drinking extreme cold or hot substances. To restore cracked teeth, our dentist at Riverheart Family Dentistry will first examine the severity of the damage on your teeth. By performing this, your dentist can determine the most suitable restorative treatment to be done. Dental Bonding. The tooth that experienced minor or superficial chipping in the enamel can be treated with Dental Bonding. It is a simple, quick and cost-effective procedure to regain the structure, shape, and strength of the natural tooth. Dental Bonding uses tooth-colored Composite resin to restore the damaged tooth and still look as natural as possible. Dental Crown. The tooth that needs to be extensively repaired will be treated with dental crowns. A Crown is a cap-like dental prosthesis that is placed over the tooth to cover the severely damaged area and restore the function of the tooth while maintaining its natural look. Porcelain Veneers. Our dental office recommends Dental Veneers to restore the visible portions of the teeth and enhance the level of aesthetics as well as the teeth’s function. A Veneer is a shell-like material shaped and colored as a natural tooth that can be bonded to the front surface of the teeth. Root Canal Therapy. Other than ensuring the aesthetic features of your smile, our dentist cannot disregard the overall health of the teeth. A root canal will be performed when the tooth damage has penetrated to the pulp to ease the pain and avoid further infections. For a picture-perfect smile, visit your dentist in O’Fallon and restore the appearance, structure, shape, strength, and function of your teeth. 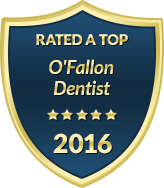 Restore and strengthen your teeth through Cracked Tooth Repair in O’Fallon, MI. Contact us at Riverheart Family Dentistry to book your appointment. We are located at Woodlawn Plaza 8618 Mexico Rd., O'Fallon, MO 63366.